Following a challenging period WEW was taken over by THIELMANN in May 2016, allowing the company to recover and rebuild as THIELMANN WEW under the banner of the world’s leading manufacturer of stainless steel containers. With an annual turnover of almost €200 million, THIELMANN has been serving the stainless steel container market for 275 years. With the acquisition of THIELMANN WEW, the group’s product offering consists of stainless steel containers with capacity of between five and 50,000L. THIELMANN is providing its solutions to an extensive range of industries including chemical, nuclear, oil and gas, pharmaceutical and food and beverage. Overall, the acquisition of THIELMANN WEW is part of a wider period of a corporate-wide growth for THIELMANN. In addition to expanding its footprint into new regions, beginning its own operations in the US and adding renting and leasing to its offerings, the group has moved into the defence sector for the first time. With its strong background in the military market, defence remains a key market for THIELMANN WEW. The company’s fuel and water transport and distribution solutions are used by military forces around the world, with its work in this sector accounting for 70% of turnover. Being under the roof of THIELMANN has given the company the solid financial foundations to invest further in this market, participate in long-term military programmes, provide closer collaboration with customers, and in the medium term, invest into innovation for the benefit of customers. THIELMANN’s engagement in WEW is already showing very positive signs as many customers continue to do business and as a consequence the order books are filling up. New contracts have been signed with key European and North American militaries, including a significant win as part of the team selected to provide the Camel water system to the US Army. Overall the financials have been improved resulting in a small profit for the past year. 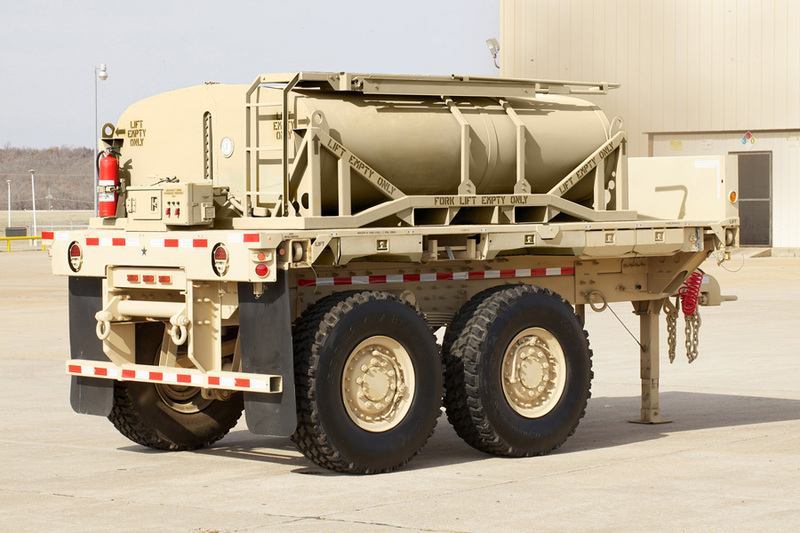 Under this contract, WEW is delivering low-profile 800 US gal water tank modules for integration onto the M1095 trailer. This complete system, known as the Camel II Unit Water Pod System is a key element of the US Army’s primary water distribution system for platoon level and below. The work follows on from a programme undertaken in 2013-14 that saw the company deliver 327 Camel tank units for the army, and is a testament to the extremely high standard to which THIELMANN WEW tanks are engineered. Deliveries began in August 2017 with six units a week being produced at the facility in Weitefeld, Germany. Underlining these achievements is the drive to keep innovating. In late 2017 THIELMANN WEW introduced a new fuel solution to its product line, the Fuel Storage and Dispensing System for the remote refuelling of land vehicles during deployed operations. The system delivers up to 46,000L of diesel or petrol fuel direct to military vehicles from a self-bunded stainless steel tank, with an on-board, self-contained climate-controlled office space for personnel. This unique solution has already been delivered to a military customer in the Middle East, and additional units have now been ordered. The ability to expand its manufacturing capacity, diversify its project base and serve multiple customers at once has also been a positive effect of the THIELMANN take-over. “The THIELMANN WEW engineering team is already embedded in the global THIELMANN engineering team, allowing us to efficiently exchange knowhow, learn from each other and collaborate closely on joint projects,’ Loeser said. “The facility at Weitefeld is not only a production facility, but much more an engineering centre in its best sense - we see THIELMANN Weitefeld in the future as a defence and civil engineering facility with final assembly attached. As a whole, the group’s key strengths lie in its engineering excellence, and its focus on supplying whole system solutions, not just tanks. Its containers form only one part of these unique solutions, which can comprise any number of bespoke accessories, from integrated pumping and preservation systems, to special coatings - such as a titanium surface - for the tanks themselves. “Together we offer a broad expertise in developing and manufacturing stainless steel containers, combined with an in-depth understanding of the transport of any kind of goods in extreme environments,” Loeser said. “The THIELMANN goal is to become the world’s biggest manufacturer of stainless steel containers, and there is really no limit to what we can offer.